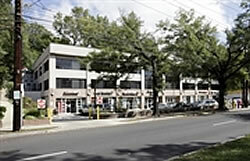 Lakritz Adler Real Estate Investments bolstered its local investment portfolio with the acquisition of the MacArthur Professional Center at 5185 MacArthur Blvd. NW in Washington, D.C. from Rock Creek Property Group for $14.925 million, or approximately $342 per square foot. The sale comes after nine years of ownership for Rock Creek, which purchased the 43,600-square-foot office property in 2005 for $10 million. Constructed in 1968, the MacArthur Professional Center is situated near the Maryland-D.C. border in the Uptown submarket. The three-story building underwent renovations in 1999 and today houses a tenant roster that includes Interplan Inc. and John I. Haas, as well as Brookville Pharmacy and Starbucks occupying ground floor retail space. The sale follows Rock Creek’s acquisition of 646-654 H St. NE, a development site comprised of 7,000 square feet of land and 8,000 square feet of commercial space across five separate properties. Plans are in place to develop a 30-unit apartment complex with roughly 6,000 square feet of ground floor retail space. Please see CoStar Comp #3049438 for more information on the MacArthur acquisition.